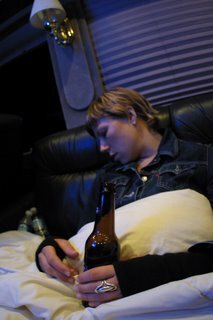 Matt took this photo moments before the Bud Light slipped from my fingers, I put the comforter on the seat next to me, burrowed my head under it, made a fort, and went to sleep on a pillow of two water bottles. that is so funny jessica. when are you coming home and having a beer with Jeremy and I? october! yay! we love october! and we love exclamation points because they show how much we love october!!! !